Artist concept of the Block I configuration of NASA’s Space Launch System (SLS). The SLS Program has completed its critical design review, and the program has concluded that the core stage of the rocket will remain orange along with the Launch Vehicle Stage Adapter, which is the natural color of the insulation that will cover those elements. For the first time in almost 40 years, a NASA human-rated rocket has completed all steps needed to clear a critical design review. 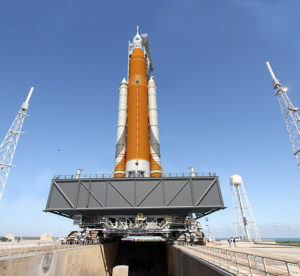 The agency’s Space Launch System is the first vehicle designed to meet the challenges of the journey to Mars and the first exploration class rocket since the Saturn V.
SLS will be the most powerful rocket ever built and, with the agency’s Orion spacecraft, will launch America into a new era of exploration to destinations beyond Earth’s orbit. The CDR provided a final look at the design and development of the integrated launch vehicle before full-scale fabrication begins. The CDR examined the first of three configurations planned for the rocket, referred to as SLS Block 1. The Block I configuration will have a minimum 70-metric-ton (77-ton) lift capability and be powered by twin boosters and four RS-25 engines. The next planned upgrade of SLS, Block 1B, would use a more powerful exploration upper stage for more ambitious missions with a 105-metric-ton (115-ton) lift capacity. Block 2 will add a pair of advanced solid or liquid propellant boosters to provide a 130-metric-ton (143-ton) lift capacity. In each configuration, SLS will continue to use the same core stage and four RS-25 engines. The SLS Program completed the review in July, in conjunction with a separate review by the Standing Review Board, which is composed of seasoned experts from NASA and industry who are independent of the program. Throughout the course of 11 weeks, 13 teams – made up of senior engineers and aerospace experts across the agency and industry – reviewed more than 1,000 SLS documents and more than 150 GB of data as part of the comprehensive assessment process at NASA’s Marshall Space Flight Center in Huntsville, Alabama, where SLS is managed for the agency. The Standing Review Board reviewed and assessed the program’s readiness and confirmed the technical effort is on track to complete system development and meet performance requirements on budget and on schedule. The program briefed the results of the review in October to the Agency Program Management Council, led by NASA Associate Administrator Robert Lightfoot, as the final step in the CDR process. This review is the last of four reviews that examine concepts and designs. The next step for the program is design certification, which will take place in 2017 after manufacturing, integration and testing is complete. The design certification will compare the actual final product to the rocket’s design. 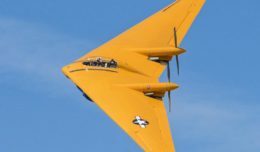 The final review, the flight readiness review, will take place just prior to the 2018 flight readiness date. Critical design reviews for the individual SLS elements of the core stage, boosters and engines were completed successfully as part of this milestone. Also as part of the CDR, the program concluded the core stage of the rocket and Launch Vehicle Stage Adapter will remain orange, the natural color of the insulation that will cover those elements, instead of painted white. The core stage, towering more than 200 feet tall and with a diameter of 27.6 feet, will carry cryogenic liquid hydrogen and liquid oxygen fuel for the rocket’s four RS-25 engines. The integrated spacecraft and payloads are nearing completion on their CDR. Flight hardware currently is in production for every element. NASA is preparing for a second qualification test for the SLS boosters, and structural test articles for the core and upper stages of the rocket are either completed or currently in production. NASA also recently completed the first developmental test series on the RS-25 engines.